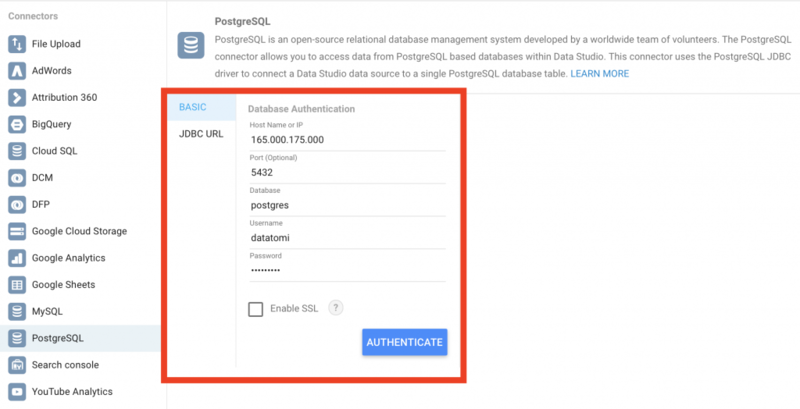 Connecting Google Data Studio to your PostgreSQL database is easier than you would think. I will walk you through the whole process step by step. By the end of the article you will learn how to visualize your PostgreSQL data within a few minutes. 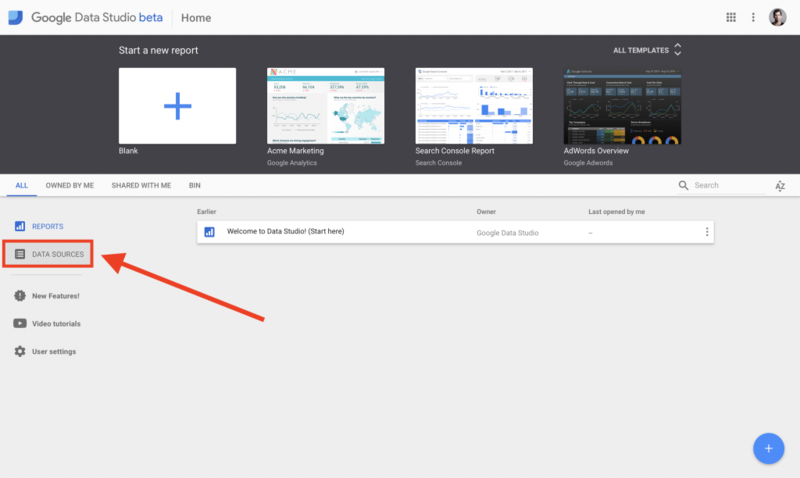 If you haven’t done it yet, register for Google Data Studio. You can do it on datastudio.google.com. It’s free; all you need is a gmail email address. STEP 1: Add a new Data Source! When you go to datastudio.google.com, you will see this landing page. Here, you can set up new reports and manage your existing ones. But what we want to do first is add a new Data Source. So click the Data Source button. It will list all the data sources you already have. If this is your first time with Data Studio, you will see an empty list. Either way, just click the little plus button on the bottom right corner. STEP 2: Select your connector! On this new window, you see many many connectors. You can connect to your Google Analytics data, your Google Adwords data, your Youtube data, etc. If you are looking for even more connectors, click the ‘EXPLORE CONNECTORS’ button and you will get dozens more. STEP 3: Provide your data server login credentials! A “Database Authentication” window pops up. (Sometimes, before that, you also need to authorise your Google Drive account. It’s a one-click thing.) Don’t get intimidated; you just have to type the very same credentials that you use with SQL Workbench or pgadmin4. Note: if you have no idea what am I talking about, go through the Install Python, R, SQL and bash article first! Username: your SQL user’s username. Password: the password for your SQL user. Enable SSL connection: you can decide whether you want to use secure connection (tick it) or not (don’t tick it). For now, I’ll go without SSL connection. It’s just fine for practicing. STEP 4: Select a datatable! Next step: you have to select the data table you want to work with! Just choose the one you want to import! I have only one table on my server: the zoo data set. Either way you go: click ‘CONNECT’ in the top right corner! STEP 5: Format your datatable! As a last step of importing, you have to name your new datatable. Pick something simple and meaningful. You can also rename your columns and set the data type and the aggregate function as necessary. Example #1: my zoo dataset. 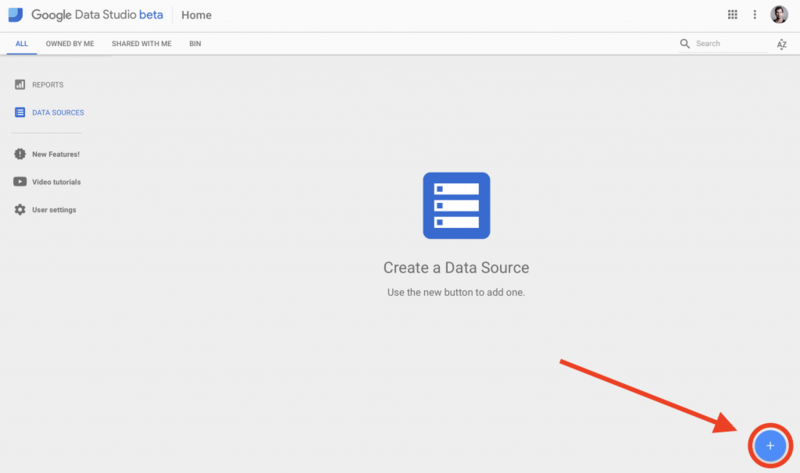 Note that every data import will create a new Google Data Studio data source. STEP 6: Create your reports. And you are done! 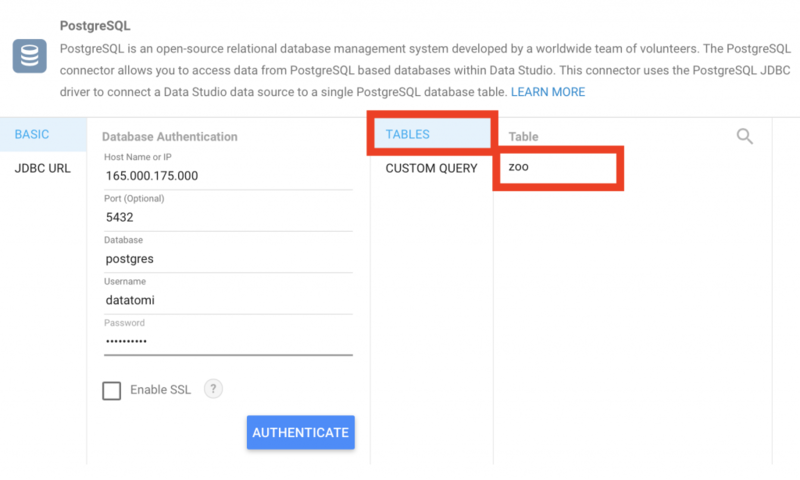 From now on, the connection between Google Data Studio and your PostgreSQL table will be there when you need it. It’s time to create some charts. Example #1: a chart for my zoo data set. Example #2: a bar chart to show the number of animals for my zoo-data-counted data set. 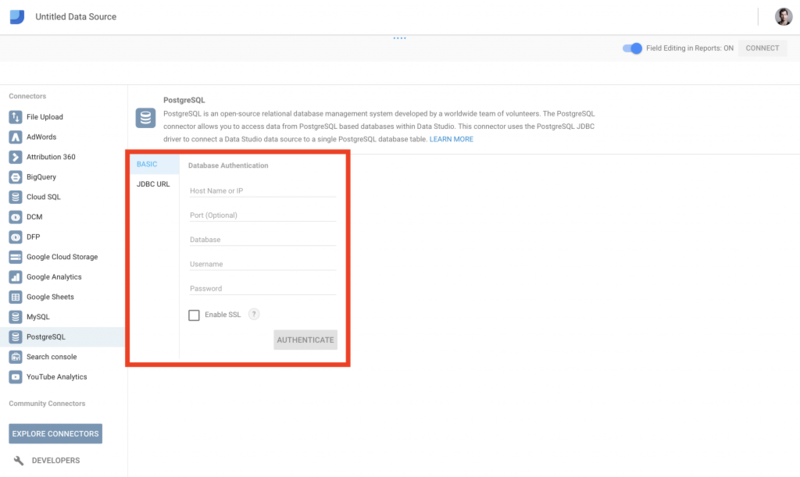 If anything changes in your PostgreSQL table, it will come automatically to Data Studio as well (so you don’t have to set up a new connection, just simply refresh your charts) which is awesome. 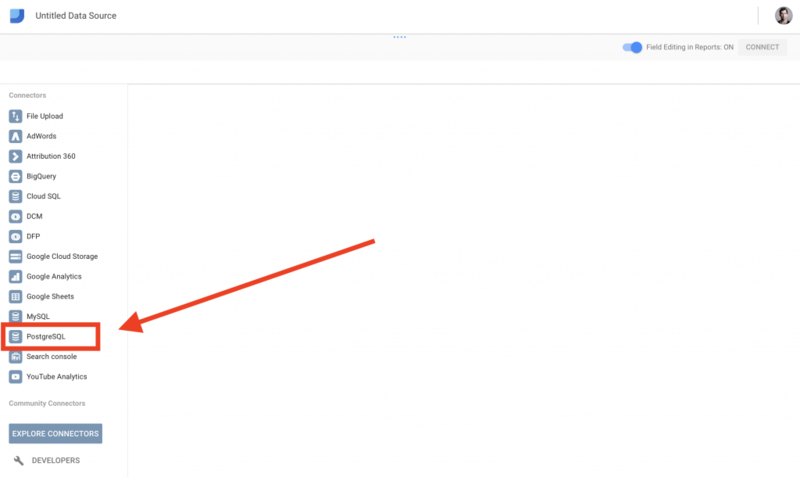 This is how to connect Google Data Studio to PostgreSQL! Wasn’t that hard, was it? Now, you are ready to visualize your SQL data in a simple and efficient way. Access denied, please check your username and password. if you did everything like it was described (and I assume you did, since PgAdmin is working), then it might be a firewall issue. Try to run SQL Workbench as administrator (if you are on windows), pause your firewall programs and/or whitelist SQL Workbench and your server’s IP and it should work! Let me know wether this fixed the issue or not! How I could import more than one table? in my case I have many tables, I have to do it one by one? Thanks.